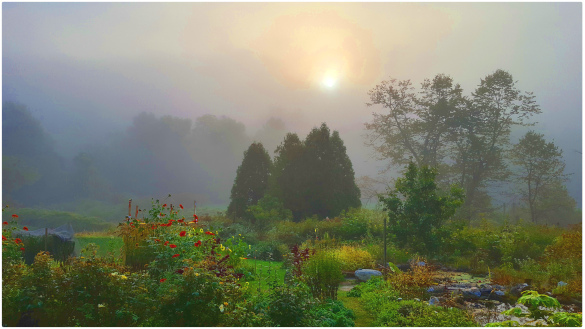 A misty autumn morning at South River Farm. Photo by Annabel Levine. As we enter our 40th season of making miso at South River Miso Company, we are grateful to all who have helped us reach this milestone. We hope to be able to provide you with our delicious and nourishing miso for many years to come! Our online store is now open for shipping to all parts of the country, weather permitting. The staff smiles in the shop after our annual fire-lighting ceremony. Photo by Gaella Elwell. The 2018-2019 season marks forty years of making miso, first as Ohio Miso in 1979 and then a few years later as South River Miso Company. Nestled in the picturesque hilltowns of Western Massachusetts, we lit the first fire at our current facility on October 22nd, 1982. We are proud that forty years of koji, beans, grains, and a cast of special ingredients, like nettles and wild leeks, have nourished us, our families, and our customers for decades. Although the grains and beans are important components of the recipe, we like to say that our main ingredient is time. We age our ten varieties of miso between three weeks and three years, sometimes longer, but the length of fermentation is not our only expression of time as an ingredient. We use a bit of a previous batch of miso, "seed" miso, to assist in the fermentation of each new batch. 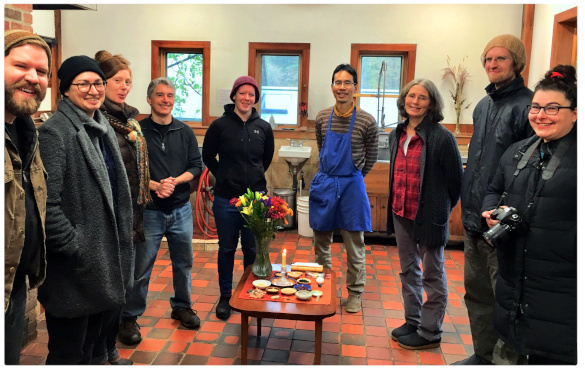 In that way, we still have a strong link to the very day we started making miso and as a result, forty years of work, intention, and nourishment are present in each jar of South River Miso. Take a look through our archives and it becomes clear that not much has changed over the years...the production shop, the process, the aprons...all warmly familiar. Our photos and literature reflect a constancy in adhering to the centuries-old Japanese farmhouse tradition that we so long ago committed to. While we have added to our facilities and improved in many ways, we still hold firm to wood-fire cooking the highest quality ingredients, processing them by hand, and having the patience it takes for our miso to mature into the delicious food that we have all come to rely on. As the weather gets cooler, we look to spend time in the kitchen creating warm and nourishing food. 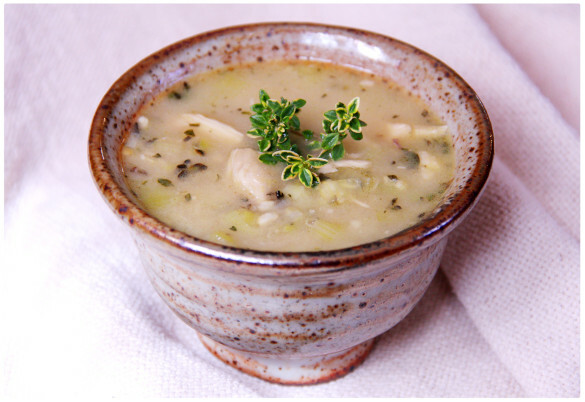 In honor of our fortieth season making miso, please enjoy this recipe for 40 Garlic Clove Chicken Soup from our food artist in residence, Chef Jen. This recipe serves 12 and is perfect for your next gathering. Or, you may just want to have plenty of leftovers as this delicious soup is also great warmed up and eaten regularly to support health this time of year. Bowl of 40 clove soup garnished with lemon thyme. Photo by Annabel Levine. Chicken and garlic right out of the oven. Photo by Annabel Levine. Place garlic heads around chicken. Drizzle with olive oil, salt, and pepper. Put pan in oven. 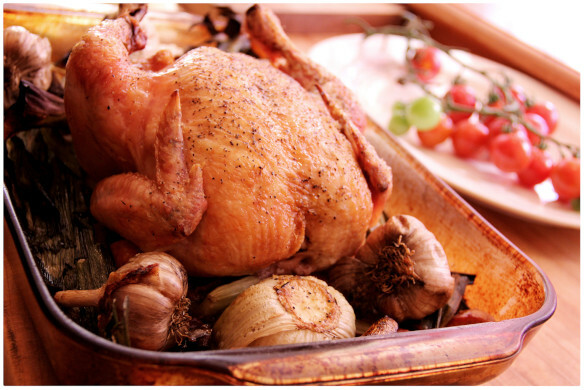 Check chicken every 20 minutes, basting each time until golden brown. When the temperature next to the leg bone is 165 degrees, remove from oven and cool. To start soup base, add leeks to a soup pot. Saute with thyme in olive oil for ten minutes over medium heat. Add roasted garlic to soup pot. To get garlic out of it's skin, cut root end off roasted garlic bulb and squeeze out the cloves. Remove all skin and meat from the chicken, then chop and add to the garlic and leeks in the soup pot along with the drippings from the roasting pan. Add 8 cups of stock/bone broth to the soup pot, let simmer for five minutes. Add coconut cream and lemon juice. Add miso by mixing the miso with a small amount of broth and then adding it to the soup pot a few minutes before serving. The South River crew waves from atop a jar. Drawing by Annabel Levine. South River Miso is excited to announce that we are now on Instagram! Follow our feed here for behind-the-scenes content displaying our process, our beautiful South River Farm location, throwbacks from our 40 years of miso-making, and more! 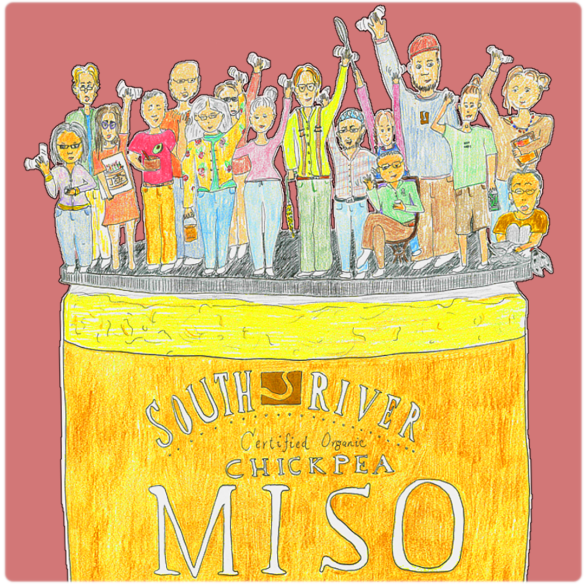 Use the hashtag #southrivermiso to connect with us, and your fellow miso lovers. See yah on the 'gram! "35 yrs ago I visited the newly finished facility - I must say it doesn't seem that long ago - 35 years of the best miso anywhere! Thank you all!" "Ordered your miso for the 1st time. Dandelion leek & 3yr Barley. Delicious!! I love the little chunks of goodness in the miso. Very smooth & tasty. Thank you for a great quality product. I've never had a miso this good, and I feel so satisfied after I drink it." Please join our community on Facebook, Instagram, and YouTube.